Xamarin was founded by nice engineers(Nat Friedman & Miguel de Icaza of Mono fame) who built MonoTouch and Mono for Android which are cross-platform implementations of Common Language Infrastructure (CLI) and Common Language Specifications. With Xamarin, you write your apps entirely in C# and being able to publish the apps to iOS store as well as Android store. So with Xamarin, no more need of learning a new language but still being able to publish your apps to the other mobile OS stores. Another compelling feature, you can build your apps for Android/iOS from your Windows machine as well as Mac machine. It’s awesome! To start building your apps using Xamarin, you first need to setup your PC to be able to work with Xamarin. The 1st step to start is to download Xamarin from http://xamarin.com/download. Once you have filled in the form and go to the Thanks page, a downloader is already being downloaded on your PC. Double click the XamarinINstaller.exe file and the setup will start on the computer. The installer will install all the pre-requisites along with Android SDK, Xamarin Studio and libraries Xamarin.Android & Xamarin.VisualStudio for creating apps. 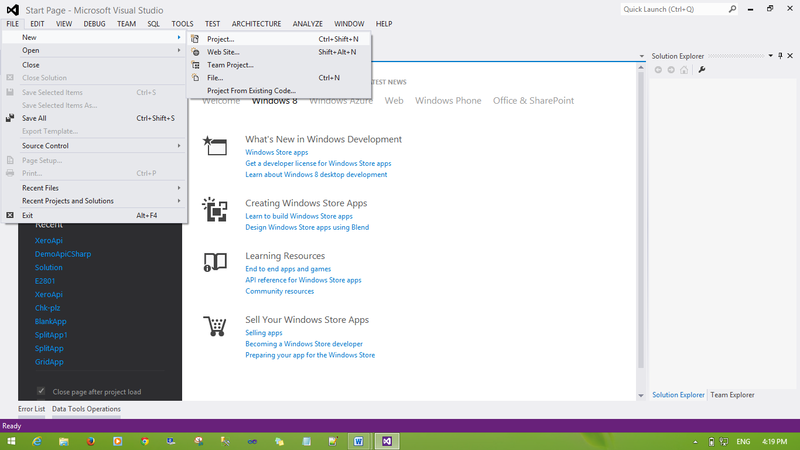 Once the software is installed, you can start building apps using Xamarin Studio or Visual Studio as well. One thing to note is that to start using Xamarin in Visual Studio you either need Business edition or can start a free trial of the same. • Select Android from the left tree and then select “Android Application” template from the right. Type in a name for the project and hit OK or press “Enter”. • As soon as the project is created with this template, you will see a lot of files and folders created as below. o References folder - Contains all references added to the project. It is to be noted that a reference to Mono.Android has been added to the project. o Assets folder - This folder contains all the files that needs to be included in the final package. You can access the files included in this folder at runtime using Assets class. o Resources folder - The resources folder contain application resources. For example, the resources folder has the icons used by the application under Resources\Drawable folder, the layout of the screens under Resources\Layout folder and the XML Value definitions under Resources\Values folder. Now, let’s discuss the template in detail. This file stores the layout of the App screen. 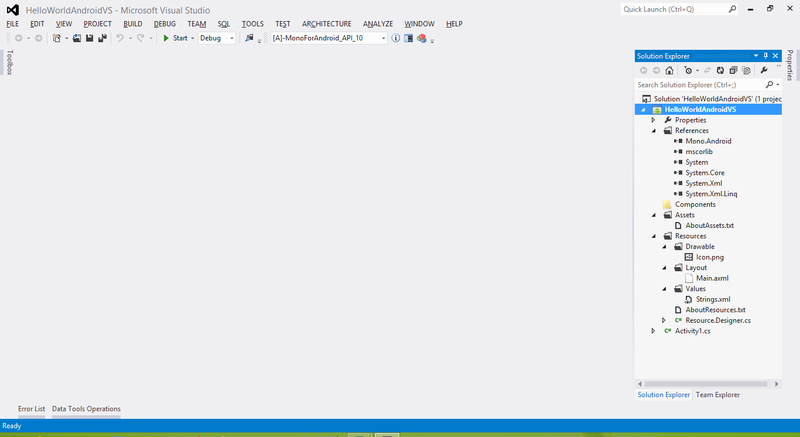 The layout are stored under Resources\Layout folder and is in simple words a XML file storing the layout. In the above code layout, we define a LinearLayout control to store all other controls. We further define the Orientation property of the layout to be set at vertical. Further, we add a Button control to the layout’s controls. 2 important things to be noted with the button control are the android:id and android:text properties. The android:id property assigns the ID of the button control. Setting the ID value of the control in the format “@+id/BUTTON_ID” allows us to access the control in the Activity file. We will see this later in the article. 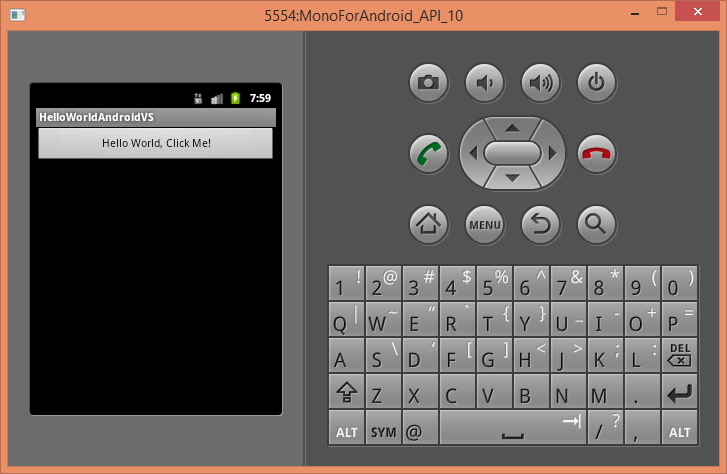 The android:text property assigns the text of the button control. Setting the Text value of the control in the format “@string/KEY_NAME” allows the app to read the user defined declaration present in XML file and assign the value to the control. The string.xml file contains all user defined string resources that can be used by the app’s layout. For ex- the above file defines 2 custom resources named “Hello” and “ApplicationName”. If you see the Main.axml file, you will notice we have set the button text to “@string/Hello”. This key “Hello” is located in String.xml file and the app reads the data from this file. This is the most important part of the Android App created and I explain the same here. 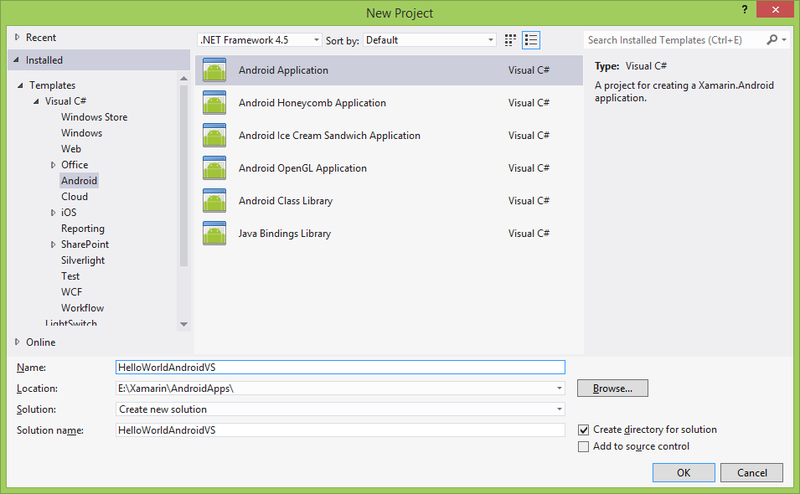 At the beginning the Android namespaces are added to the project. Then, the class is defined and the class is decorated with a couple of attributes. The “Label” property defines the name appeared on the Activity screen. The “MainLauncher” property tells the android runtime engine to load this Activity as the main screen of the app. The “Icon” property defines the icon to be displayed for the Activity. The above line loads the main.axml file present in Resources\Layout folder. If you notice, you can access the Resources folder using the Resources class in code behind. The Resource class is in the file Resource.Designer.cs and is auto generated when the program is compiled. The Resource class creates a nested class named “Layout” to store all .axml files present in Resources\Layout folder. After setting the layout, we find the button using FindViewByID< >(). This function lets you reference any control on the .axml file using the ID of the control. Another thing to notice here is we can actually access the ID of the control using Resource.ID class. Internally when the app creates the Resource class it also creates a nested class named “ID” to store ID of all controls present in .axml files. The final statement is a plain C# statement where we add a Click event handler to the button and modify its text. After you click on the button, the app changes to the below screen. Hope you like this article. Let me know if you have any doubts/questions via comments below.